With their upcoming new album, rock band idol group CNBLUE recently revealed their transformed charismatic self in the June edition of Singles. In the photo shoot, the members are shown with heavy smoky makeup and a chic expression to show off a bad boy image. 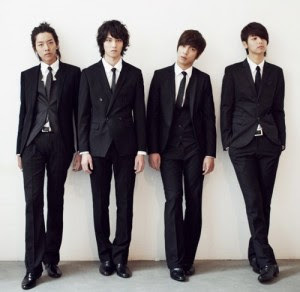 Leader Jung Yonghwa added, “It [album] consists of songs that are easy and rhythmical so they are good to sing along to. Moreover, because we have personally composed and wrote some of these songs, this album is more precious to us,” showing a particular affection for their new album. When Yonghwa was asked what he does for leisure during his spare time, he replied unexpectedly, “I received a lot of influence lately from wife Seohyun so I’ve been reading a lot of books.” Jung Yonghwa and SNSD’s Seohyun are a make-believe couple on the MBC reality show We Got Married.